The right to not be killed, without being first found guilty of wrongdoing, after notice of charges, due process, and a jury trial, goes back to the Magna Carta (1215). Smokers, like all consumers, have a right to a safe product. A safe product is one that is not harmful when used as the manufacturer intends it to be used. Above all, it must not kill [reason: no due process]. Tobacco companies, according to smokers themselves, violate this smokers' right, this constitutional right we all have. "Research funded by Defendants themselves provided evidence confirming the public health authorities' warnings that nonsmokers' exposure to cigarette smoke was a health hazard." United States v Philip Morris USA, Inc., 449 F.Supp.2d 1, 708-709 (D.D.C. 2006), aff'd 556 F.3d 1095 (CA DC, 2010), cert den, 130 S. Ct. 3501 (2010). "The district court found that dating back to the 1970s, Defendants' own research and analysis revealed the hazards of secondhand smoke." United States v Philip Morris USA Inc., 556 F.3d 1095, 1126 (CA DC, 2010), cert den, 130 S Ct 3501 (2010). and as recent as Philip Morris, et al v Reilly, Atty Gen, Massachusetts, ___ F3d ___ (CA 1, 16 Oct 2001) (upholding Massachusetts Tobacco Ingredients and Nicotine Yield Act against tobacco company opposition to disclosure). So the question is, what are tobacco companies hiding? What are they afraid will be found out? The @#*%&$@ taxman saw, and wanted to tax them! and the pushers 'doth protest too much,'! and the truth (tobacco sweepings from off-the-floor) came out!!! published nationwide, like all Supreme Court decisions!!! For more cigarette tax / evasion cases, click here. And see also the 1850's incident of 'Havana cigars' actually having no tobacco at all in them! These are clues that tobacco pushers may have something to hide! It is unlawful to take concerted action, engage in conspiracy, to violate federal legal rights, as per laws such as 18 USC § 241. See also 18 USC § 242. Let's look at the medical facts, then see what tobacco users themselves say about tobacco companies violating their right to a safe product, meaning, violating the right to due process of law before one can be killed. Cigarettes contain and emit toxic chemicals. The nature and effect is at the ultrahazardous level. The foreseeable "natural and probable consequences" to millions of people is an "increased risk of death." Nonetheless, some people say that claims of a hazard are new! And that litigation against tobacco companies is new. Such pro-tobacco apologists invoke 1990's so-called "politically correct" concepts to ridicule action against tobacco hazards. In 1555, "The French writer, André Thevet [1502-1590], described the serious effect of tobacco on the sexual system in the year 1555." In 1602, Thomas Bushell published Work for Chimny-sweepers, or, A warning for Tabacconists Describing the Pernicious Vse of Tabacco (London: T. Este, 1602). In 1603, Oxford University (England) sponsored information on the tobacco hazard in brain-impact terms. In 1604 James Stuart (King James) published A Counterblaste to Tobacco (London: R. Barker, 1604). In 1665, Dr. Simon Paulli [1603-1680] published Commentarius de abusu tabaci Americanorum veteri, et herbae thee Asiaticorum in Europa novo (Argentorati: Sumptibus, 1665). In 1671, there was "scientific study of tobacco and its effects on the body," "when the Italian biologist, Francesco Redi, published an account of the lethal effects of the 'oil of tobacco. '"—Susan Wagner, Cigarette Country: Tobacco in American History and Politics (New York: Praeger, 1971), p. 64. In 1792, "Tobacco amblyopia, as a recognised disease, has an ancestry which dates from the year 1792, when attention was first drawn to it . . . ." This fact from 1792 was already ancient history when cited by Professor Dr. Hugh Percy Dunn to his ophthalmology students, in his "Post-Graduate Lecture on Tobacco Amblyopia," Vol 2, The Lancet (Issue #4344) pp 1491-1493 (1 Dec 1906). In 1797, Rev. Adam Clarke published a book against tobacco, A Dissertation on the Use and Abuse of Tobacco (London: G. Whitfield, 1797). In 1798, Benjamin Rush, M.D., Observations Upon the Influence of Habitual Use of Tobacco upon Health, Morals and Property (1798), reported adverse effects on the stomach, nerves, and oral cavity, and the now well-established tobacco-alcoholism link. Rush was one of the "Founding Fathers," having been a signer of the Declaration of Independence. He was also Surgeon General under George Washington! In 1828, occurred the discovery of nicotine. In 1833, Orin S. Fowler [1791-1852] published A Disquisition on the Evils of Using Tobacco and the Necessity of Immediate and Entire Reformation (Providence: S. R. Weeden, 1833). In 1836, a medical survey of nicotine poisoning deaths was published. "Death occurred in nearly all of the cases of nicotine poisoning within a few minutes to a few hours . . . ."—Julia Fontanelle, 2 Jour. de Chimie Med. 652 (1836). Also by 1836, it was well-established "that thousands and tens of thousands die of diseases of the lungs generally brought on by tobacco smoking. . . . How is it possible to be otherwise? Tobacco is a poison. A man will die of an infusion of tobacco as of a shot through the head." —Samuel Green, New England Almanack and Farmer's Friend (1836). 1836, also, Dr. William A. Alcott published an exposé, Tobacco: Physical, Intellectual, and Moral Effects. In 1844, Bertrand Boussiron published De l'Action du Tabac sur la Santé et de son Influence sur le Moral et l'Intelligence de l'Homme (Paris: B. Dusillion, 1844). In 1845, Rev. Benjamin Lane [1797-1875] published a book about tobacco dangers, The Mysteries of Tobacco (New York: Wiley and Putnam, 1845). In 1847, the lawsuit of Commonwealth v Thompson, 53 Mass 231 (1847) recognized the fire hazard. Massachusetts had been a leader before; in the 1630's, it had banned tobacco sales and public smoking. In 1848, John Burdell, D.D.S., published Tobacco: Its Use and Abuse (New York: Fowler and Wells, 1848). In 1849, eighty-seven conditions were identified as tobacco-linked, by Dr. Joel Shew, Tobacco: Its History, Nature and Effects on the Body and Mind (New York: Fowlers and Wells, 1849). In 1853, Dr. Elisha Harris [1824-1884] published Tobacco: The Effects of its Use as a Luxury on the Physical and the Moral Nature of Man: A Prize Essay (New York: Wm. Harned, 1853). In 1855, Russell Thacher Trall [1812-1877] published Tobacco: Its History, Nature, and Effects. With Facts and Figures for Tobacco-Users (New York, Fowlers and Wells, 1855). In 1858, there was an exposé of tobacco adulterations: Henry P. Prescott, Tobacco And Its Adulterations (London: John Van Voorst Pub, 1858). In 1859, cancer of the lip was found to be 100% tobacco-correlated in a study by French Dr. Bouisson (1859). His was a "well-documented clinical study of the matter."—E. Cuyler Hammond, "The Effects of Smoking," 207 Scientific American (#1) 39-51 (July 1962). (Details). Also in 1859, Dr. John Lizars published The Use and Abuse of Tobacco (Edinburgh, 1859). In 1862, Dr. Reuben D. Mussey published "Tobacco--Influence Upon Life and Health" (Boston: Gould & Lincoln, 1862). In 1875, the "association between excessive smoking and deafness was noted by de LaCharrière—S. L. Shapiro, MD, "Are You Smoking More But Hearing Less?" 43 Eye Ear Nose Throat Monthly 96-100 (1964). In 1876, Dr. Hippolyte Adéon Dépierris [1810-1889] published Physiologie Sociale: Le Tabac, Qui Contient Le Plus Violent des Poisons, La Nicotine Abrége-t-il l'Existence? Est-il Cause de la Dégénérescence Physique et Morale des Sociétés Modernes? (Paris: E. Dentu, 1876). In 1878, Dr. J. Blanchet published Cri d'alarme: Du Tabac au Point de Vue Médeical (Paris: Delahaye Pub, 1878) on tobacco dangers. Rev. B. W. Chase published Tobacco: Physical, Mental, Moral and Social Influences. In 1879, Dr. Emile Decaisne published "Les femmes qui fument," 1 Rev d'hyg Paris 914-922 (1879) on tobacco dangers. Dr. James Jackson published Tobacco and Its Effect upon the Health and Character. Beginning in 1879, three cases, Carver v State, 69 Ind 61; 35 Am Rep 205 (Nov 1879), Mueller v State, 76 Ind 310; 40 Am Rep 245 (May 1881), and State v Ohmer, 34 Mo App 115 (5 Feb 1889) recognized that tobacco delivers a dangerous addictive drug, nicotine. In 1881, the Wisconsin Board of Health had a Report on the Use of Tobacco from Dr. G. F. Witter. Dr. Hippolyte Adéon Dépierris [1810-1889] published La Tabac et la Famille: Il Cause la Rareté et la Sterilité des mariages, la Débilité Native et la Mortalité des Enfants, la Dépopulation des Pays (Paris: E. Dentu, 1881). In 1882, books on tobacco effects were published by Meta Lander (The Tobacco Problem); and Dr. John Hinds (The Use of Tobacco). In 1884, the first warning that the cigarette formula had been changed, was issued. The formula change was to add coumarin, for rat poison, to cigarettes as a revenge measure by unreconstructed Confederate tobacco farmers, against the hated "d--n Yankees." In 1884, Dr. Lamartine G. Hardman [1856-1937] issued "Tobacco Poisoning," 1 Atlanta Med & Surg Journal 648-650 (1884-5). In 1886, A. Rouillard published Effects du Tabac sur l'Intelligence (Paris: 1886). In 1889, the Michigan House of Representatives recognized that tobacco is deleterious to youths as cited by the 1889 Michigan House Committee on the subject. In 1889 also, Dr. G. W. Jacoby's medical journal article reverified tobacco-caused brain damage: "Autopsies have revealed large foci of softening in the brain, hemorrhages into the meninges, and capillary apoplexies in the brain substance." See G. W. Jacoby, 50 New York Medical Journal 172 (17 August 1889). Also in 1889, Rev. John Wight published Tobacco: Its Use and Abuse. He noted that many southern tobacco farmers grow separately, for themselves, p 34. See also "Rat poison added to tobacco for 'flavor'" (18 August 1999), saying, e.g., that "tobacco companies, by their own published admission in their trade publications, introduce a deadly pesticide-rodenticide called Warfarin or coumarin into the tobacco as a "flavoring." They call it a "flavoring" in order to cover up its true identity -- that is Rat Poison!" "Whereas the custom of permitting in the street-cars of the this city is a most vile and objectionable one to the majority of our citizens . . . ; and whereas, this alone, of all the cities of the Union, allows such a discomfort to those of its citizens who ride in the public cars: Be it resolved that . . . smoking in any street-car of this city is hereby prohibited . . . and any one so offending . . . shall be fined . . . or imprisoned not less than five days, or more than thirty days. "A nuisance belongs to 'that class of wrongs that arise from the unreasonable, unwarrantable, or unlawful use by a person of his own property . . . or from his own improper, indecent, or unlawful personal conduct, working an obstruction of or injury to a right of another, or of the public, and producing such material annoyance, inconvenience, discomfort, or hurt that the law will presume a consequent damage' . . . . There is no doubt that smoking . . . caused to a great majority of the people . . . material annoyance, inconvenience, and discomfort. . . . There is not only discomfort, but positive danger to health, from the contaminated air . . . ."
"The city council . . . had authority . . . to provide for the public health. It can therefore require . . . that there shall be ventilation for a supply of fresh air . . . and, in pursuance of the same power, it can, in order to preserve pure and fresh air . . . prohibit smoking . . . It is essential to health and to comfort to have pure air . . . ."
In 1892, WCTU members during the term of Francis Willard, M.S., M.A., LL.D. (1879-1898) sent Congress thousands of petitions for banning cigarettes, citing the already then-known fact that cigarettes were "causing insanity and death to thousands" of youths. In 1897, both Iowa and Tennessee banned cigarettes due to the known danger. June 1898 high school graduates were better educated than people nowadays, both in terms of general education, and in terms of tobacco effects. In 1898, in the Spanish-American War, the Army refused to enlist smokers, as the bad health effects were already that obvious. Teddy Roosevelt would have no smokers in the "Rough Riders." The Tennessee Supreme Court in 1898, deemed cigarettes deleterious to smokers themselves, Austin v State, 101 Tenn 563; 48 SW 305 (22 Dec 1898), affirmed by the U.S. Supreme Court at 179 US 343, 21 S Ct 132; 45 L Ed 224 (19 Nov 1900). In 1902, in the case of Felsenheld / Merry World Tobacco v U S, 186 US 126; 22 S Ct 740; 46 L Ed 1085 (1902), the Supreme Court, over tobacco company objection, agreed that tobacco can be banned for containing anything other than tobacco. Also in 1902, "Ballantyne had found an increase in the abortion rate in French and Austrian women working in tobacco factories." (Details). In 1907, Dr. L. P. Clark's medical journal article reverified tobacco-caused brain danage: "Ecchymosis occurs in the pleura and peritoneum. Hyperemia of the lungs, brain, and cord is found. . . . Coarse lesions have been found in the brain and spinal cord." See L. P. Clark, 71 Medical Record (#26) 1073 (29 June 1907). In 1909, Michigan banned manufacture and sale of deleterious and adulterated cigarettes. Dr. Charles E. Slocum published Tobacco and Its Deleterious Effects. In 1911, Dr. Pieter K. Pel published "Un cas de psychose tabagique," XIX Ann. med. Chir. 171 (1911). In 1912 occurred the lawsuit revealing that tobacco leaves falling on factory floors were not discarded, but instead swept up, cleaned and used in cigarettes. This "secret" might never have been revealed except for the tax implications! (and tobacco companies' century-long penchant for tax litigation). Latimer's full-text is at Latimer v United States, 223 US 501; 32 S Ct 242; 56 L Ed 526 (PR, 19 Feb 1912). In 1912 also, Dr. Lothar von Frankl-Hochwart [1862-1914] published Die nervösen Erkrankungen der Tabakraucher (Wien, Germany: A. Hölder, 1912). In 1913, Dr. Abel Gy published L'Intoxication par le Tabac (Paris: Masson et Cie, 1913). In 1914, Thomas Edison identified cigarettes' acrolein as dangerous. Henry Ford reprinted that letter in his widely-circulated 1914 anti-tobacco book. The basic reason for product liability is clear. "We need not recanvass the reasons for imposing strict liability on the manufacturer. They have been fully articulated [in the past]. "The purpose of such liability is to insure that the costs of injuries resulting from defective products are borne by the manufacturers that put such products on the market rather than by the injured persons who are powerless to protect themselves. . . . Implicit in the [product's] presence on the market . . . was a representation that it would safely do the jobs for which it was built. . . .
"To establish the manufacturer's liability it was sufficient that plaintiff proved that he was injured while using the [product] in a way it was intended to be used . . . ." Greenman v Yuba Power Products, Inc, 59 Cal 2d 57; 27 Cal Rptr 697; 377 P2d 897 (1962). We can supplement this wise court analysis by the fact that cigarette-caused costs should obviously not be borne by nonsmokers—whether directly or by increasing their taxes and their insurance premiums. But that is what happens when the cost of dealing with the cigarette-caused injuries (medical conditions, accidents, fires, etc.) is not paid by the manufacturer. In 1915 was an early tobacco user lawsuit, Liggett & Myers Tobacco Co v Cannon, 132 Tenn 419; 178 SW 1009; LRA 1916A 940; Ann Cas 1917A 179 (25 Aug 1915). "for damages resulting . . from chewing a piece of Brown Mule tobacco in which was concealed a decomposed human toe. . . . [it] caused him to foam at the mouth, while he was getting 'sicker and sicker.' . . .
"We refrain from detailing the further harrowing and nauseating details. . . . a physician . . . testified that appellant exhibited all of the characteristic symptoms of ptomaine poison. The physician examined the toe and identified it as a human toe in a state of putrefaction, and said, in effect, that his condition was caused by the poison generated by the rotten toe. . . .
"If poisons are concealed in [ingested items] death or the impairment of health will be the probable consequence. . . .
"Anything taken in to the mouth . . . should be free of those elements which may endanger the life or health of the user." "for an illness . . . from . . . chewing tobacco . . . is imbedded the partially decomposed body of a small snake." R J Reynolds Tobacco Co v Stringer, 103 So 5 (Miss, 2 March 1925), was another tobacco users' rights case, a product liability case, upholding the right to a safe product. This time, a poisonous snake in tobacco, resulted in the tobacco user's illness. In 1928, concern about the tobacco danger was expressed thus, that it was so dangerous as to affect even animals! See H. Marsh and Clawson, "Wild Tobacco Toxic for Horses, Cattle and Sheep," 9 North American Veterinarian 30 (June 1928). In 1929, doctors wrote about concern for smokers' rights. See A. Winterstein and E. Aronson, "Legal Protection of Smoker Against Manufacture of Cigarettes Containing Too Large Percentage of Nicotine," 59 Schweiz Med Wehnschr 550-552 (25 May 1929). "to recover damages for personal injuries resulting . . . from the partial consumption of . . . tobacco . . . which was found, on smoking, to contain mutilated fragments of a dead mouse. [The court said the smoker could produce] evidence . . . to show that smoke arising from tobacco which contains decayed animal matter is poisonous and extremely dangerous when taken into the human system, and the manufacturer is aware thereof." The fact that the case is published shows that the tobacco company fought against smokers' rights to a safe product, a pattern of reaction to smokers' asking for the right to a safe product, still being followed today. "he bit the plug he broke a front tooth and found that a nail was imbedded in the tobacco." "plug of tobacco [with] a portion of a wooly worm . . . with many stingers on it [which became] imbedded in his mouth, lips, tongue, and gums . . . his mouth became very much inflamed from the poison in the stingers . . . He suffered much pain." "when a fishhook which was embedded in the plug [of chewing tobacco] 'stuck on the inner side of his lip and came out on the outside' [with] a piece of string about two inches long . . . that some other foreign substance had been found in the same brand of tobacco within two months preceding the injury; and that the foreman of the machine room had previously had complaints that other foreign substances had been left in the manufactured product." Corum "suffered pain, antitoxin to prevent tetanus, had difficulty in opening and closing his mouth, and complained of stiffness in his jaw and neck." The court traced the history of prior such adulterated tobacco cases. "took a chew . . . and upon getting it in his mouth he found there was some foreign substance, other than tobacco, in his mouth; whereupon he immediately took the tobacco from his mouth and upon examination found an enormous quantity of small metal particles resembling steel filings or bits of small wire sticking in his tongue and mouth, which caused a burning sensation and severe pain. "[Wallace] immediately went to see a physician . . . the physician worked for some time extracting these tiny metal particles from [his] mouth and tongue . . . necessary to scrape [his] tongue and the inside of his mouth . . . some of the metal particles were swallowed by him . . . his mouth, tongue and throat became inflamed, swollen and sore; . . . he suffered intense and excruciating pain . . . a high fever . . . frequent and severe spells of vomiting." The court traced the history of prior such adulterated tobacco cases. The bottom line is that the court said that the manufacturer is liable for the defective product; products must be safe for intended use. Nowadays, pushers and their accomplices are objecting to this concept, pretending that it is a new and unprecedented notion! More tobacco pusher fraud! "exploded, causing substantial physical injury. . . . The evidence shows that the explosion was caused by a firecracker that was inside the cigar . . . there was evidence of negligence in the manufacture . . . In fact, the evidence indicates that it was the intention to make it defective as a cigar by the insertion of a firecracker in it." The court traced the history of prior such adulterated tobacco cases. "smoked the cigarette about half way through when an explosion occurred . . . like a firecracker, and burned both her cheeks, nose, and eyebrows." The court traced the history of prior such adulterated tobacco cases. The verdict was upheld on appeal, 25 NYS2d 315 (1938). "'tiny sparks and blue or greenish blue flame came right out of the end of the cigarette and ran up the man's (plaintiff's) nostrils.' . . . Its action was like that of a 'whizzer' firecracker. 'It was a flash.' The plaintiff hurriedly took the cigarette out of his mouth, but before he was able to lay it down flared up again more extensively than at first, and caused further burns on plaintiff's face. . . . the foreign and injuriously inflammable material in the cigarette which directly caused the injury . . . was in the cigarette when it left the factory." The verdict was upheld on appeal, 109 F2d 598 (CA 9, 1940). "that part of the plug from which the chew was taken contained a dead worm or moth from which extended numerous fine stickers or stingers, hard and penetrating in their nature, and each about one-eighth of an inch in length. When [Webb] placed the chew in her mouth, these stingers, in large number, penetrated the lining and tissues of the mouth." The court traced the history of prior such adulterated tobacco cases." Liggett & Myers Tobacco v DeLape, 109 F2d 598 (CA 9, 26 Jan 1940) upheld the lower court verdict. "was smoking cigarettes . . . it suddenly exploded and injured one of his eyes . . . it exploded because of a foreign explosive substance negligently permitted by the [factory] to be contained in the cigarette." In 1943, Dr. Jesse Mercer Gehman published Smoke over America (East Aurora, N.Y.: Roycrofters, 1943). In the case of In the Matter of R. L. Swain Tobacco Co, Inc, 41 FTC 312 (28 Nov 1945), the Federal Trade Commission found a tobacco company guilty of "unfair and deceptive acts and practices" "to the prejudice of the public." (4) conspiracy to monopolize. . . .
Each petitioner was fined . . . $15,000 . . . and a total of $255,000." "there came to [his health facility] one time a patient, a man named Duke. The Duke family are the stockholders of the tobacco company. Duke said it was not tobacco that caused his trouble. Duke was surprised to learn anybody would think he would use tobacco. He said he made Duke's Mixture, knew what was in it, and wouldn't use it."—Prof. Pryns Hopkins, Ph.D., Gone Up in Smoke: An Analysis of Tobaccoism (Culver City, CA: The Highland Press, 1948), pp 220-221. In P Lorillard Co v Federal Trade Commission, 186 F2d 52 (CA 4, 29 Dec 1950), the U.S. Fourth Circuit Court of Appeals upheld an FTC order directing a tobacco company to cease and desist false, misleading, and deceptive advertising. Ross v Philip Morris and Co, 328 F2d 3 (CA 8, 26 Feb 1964). SCB: 164 F Supp 683 (affirming lower court decision, stating at 13-14, that per factual evidence, the "manufacturer [must be deemed] held as an [expert] absolute insurer [of safety] against knowable dangers [as per action to] keep abreast of scientific knowledge." A "manufacturer is held to the skill of an expert, is charged with superior knowledge [above the buyer's] of the nature and qualities of its products, and is obligated reasonably to keep abreast of scientific information, discoveries, and advances." The result of these legal duties and responsibilities is that cigarettes are harmful in law if harm is foreseeeable from scientific and medical data, i.e., if "any ingredient in a cigarette was known or could have been known to be an irritant or deleterious substance that could cause cancer.") Of course, this has long been known, long prior to this decision. The manufacturer, pp 12-13, in defending itself against a charge of causing harm, is "required to offer evidence affording proof that no one, not even the most renowned scientist or the most eminent medical authority in the world, could have foreseen the cancer-producing danger that smoking cigarettes can—-under certain circumstances—-apparently create." "growers of burley tobacco [who] complain [of words] which announce, directly, or by innuendo, that the smoking of cigarettes will kill those persons who smoke them . . . . cigarette advertising . . . has been directed to young persons . . . medical or scientific body undertaking a systematic review of the evidence has reached conclusions opposed to those of the Surgeon General's. . . ."
"The doctrine of clean hands requires this Court . . . to avert further injury to the public, by the continued retardation and erosion of public awareness of the hazards of smoking . . . the mere fact that information is available, or even that it is actually heard or read, does not mean that it is effectively understood. A man who hears a hundred 'yeses' for each 'no,' when the actual odds lie heavily the other way, cannot be realistically deemed adequately informed." "although it was constitutional to require that anti-smoking commercials be broadcast, it does not follow that an injunction prohibiting the broadcast of the same commercials would likewise be constitutionally permissible." In Larus & Brother Co v F.C.C., 447 F2d 876, 880 (CA 4, 20 Aug 1971), the U.S. Fourth Circuit Court of Appeals said that "it is now reasonable . . . to assume that the detrimental effects of cigarette smoking on health are beyond controversy." A 20 July 1994 Philip Morris (PM) confidential inter-office correspondence reports on contaminants found in PM's cigarettes after investigation of consumer complaints. Contaminants found in the cigarettes included machine oils (used to lubricate the cigarette manufacturing machines), chemicals traceable to rubber bands and rubber manufacturing belts, tax stamp ink solvents, "residual solvents from promotion tags," airborne contamination picked up by cigarettes stored in "inappropriate places" like gas stations and freshly-painted warehouses, waterless hand cleaners, varnishes or lacquers used on the pack, plasticizers and polymers (including those used "as a carriers in insect repellant formulations"), glass fiber, plastic, rubber, and blood. In the case of the rubber contamination, the paper says, "The complaints covered four brands, three different factory locations, all three shifts and manufacturer over a time span from October 1993 to April, 1994." More people take cigarette products into their bodies every day than even FDA-approved pharmaceuticals like aspirin. If contaminants such as blood, rubber or lacquers turned up in a product like aspirin, most likely the manufacturer be required to notify the public about the contamination and recall the product. Smokers apparently receive no such protection. To see the document, click here. For PDF version, click here. For the TDO site copy, click here. Burton v R. J. Reynolds Tobacco Co, 177 FRD 491 (D Kans, 23 Dec 1997). See also unpub citations, 1996 US Dist LEXIS 12931 and 1997 US Dist LEXIS 1566. Intentionally violating Michigan's penal code by manufacturing and selling products containing ingredients that are unhealthy and foreign to tobacco. Gross negligence, recklessness and knowledge of defect. The suit says the companies sold addictive tobacco products knowing that they were dangerous, and rather than warn consumers, they and the Tobacco Institute instead misrepresented those dangers. Violating Michigan's Consumer Protection Act by misrepresenting their products. Fraud, misrepresentation and breach of express and implied warranties. The lawsuit claims that the tobacco companies falsely warranted their products to be safe and not a cause of lung cancer and other health problems. Violation of Michigan law prohibiting the sale of cigarettes made with added nicotine and other harmful substances. Wendling, as a result of her cigarette habit, now has a shortened life expectancy; and suffered physical, mental and emotional pain, has a permanent disability and has lost wages, benefits and earning capacity. "The proof of the pattern or practice [of tobacco company willingness to commit harmful acts such as the above] supports an inference that any particular decision, during the period in which the policy was in force, was made in pursuit of that policy." Teamsters v U.S., 431 US 324, 362; 97 S Ct 1843, 1868; 52 L Ed 2d 396, 431 (1977). During a deposition in the Mississippi case, Mike Moore, Attorney General ex rel State of Mississippi v American Tobacco Co, et al, No 94-1429. Jeffrey Wigand, Ph.D., a former Brown & Williamson Tobacco Company scientist, was a witness and testifying. During the course of his testimony, he admitted coumarin (rat poison) being added as an adulterant in tobacco. Tobacco company attorney Thomas Bezanson objected, not that the Wigand testimony was untrue, but that "on trade secret grounds," it should not be revealed!!! The testimony is reprinted in the book by Philip J. Hilts, Smoke Screen: The Truth Behind The Tobacco Industry Cover-Up (NY: Addison-Wesley Pub Co, 1996), pp 161-163. This revelation was a sensation. Dr. Wigand was interviewed repeatedly, including on 60 Minutes by Mike Wallace. Everybody seemed to think this was new information. Evidently they were misled by the false claim of Bezanson that the coumarin issue is a "trade secret." But not this web writer. I was not misled: Reason: familiarity with the pertinent literature. The people of Iowa and Tennessee chose not to become cigarette martyrs. So Tennessee banned cigarettes via the Laws of 1897, Chapter 30. Tennessee courts soon took official judicial notice of cigarettes' "inherent" deleteriousness, in a tobacco lobby case trying to overturn the law, Austin v State, 101 Tenn 563; 566-7; 48 SW 305, 306; 70 Am St Rep 703 (22 Dec 1898) affirmed 179 US 343; 21 S Ct 132; 45 L Ed 224 (1900). Michigan quickly followed Iowa's and Tennessee's example with MCL § 750.27, MSA § 28.216, a 1909 law that forbids "any person within the state" from action that "manufactures, sells or gives to anyone, any cigarette containing any ingredient deleterious to health or foreign to tobacco . . . ."
Such laws are essential as ". . . the immediate effect of smoking . . . is a lowering of the accuracy of finely coordinated reactions (including associative thought processes). "—John H. Kellogg, M.D., LL.D., F.A.C.S., Tobaccoism, or, How Tobacco Kills (Battle Creek, MI: The Modern Medicine Publishing Co, 1922), p 88. In other words, tobacco causes brain damage, impairing their ability to comprehend the danger one is in. This is an especially vicious thing, as pushers have a record of targeting defenseless and unsuspecting children. The result when laws against poisoning people either do not exist, or are unenforced can be said succinctly: "Cigarette Makers Get Away With Murder," says Elizabeth M. Whelan, Sc.D., M.P.H., The Detroit News, p 4B (14 March 1993). Due to cigarettes' deleteriousness, "Over 37 million people (one of every six Americans alive today) will die from cigarette smoking years before they otherwise would," see DHEW National Institute on Drug Abuse (NIDA), Research on Smoking Behavior, Research Monograph 17, Publication ADM 78-581, p v (Dec 1977). This number constitutes a "holocaust" (referring to the then "annual death death toll of some 27,500"), see Royal College of Physicians, Smoking and Health Now (London: Pitman Medical and Scientific Publishing Co, 1971), p 9. Such deaths are "natural and probable consequences," a term defined in Black's Law Dictionary, 6th ed (St. Paul: West Pub Co, 1990), p 1026, as events happening "so frequently as to be expected [intended] to happen again." Cigarette deaths are not "accidents" ("unexpected" "unusual," "fortuitous" events), p 15. See Metro North Commuter Railroad Co v Buckley, 521 US 438; 117 S Ct 2113; 137 L Ed 2d 661 (23 June 1997). This case was on a lawsuit by a 15 year smoker. It alleged that re asbestos, "the exposure created an added risk of death due to cancer, or to other asbestos related diseases of either 1% to 5% (in the view of one of plaintiff's experts), or 1% to 3% (in the view of another)." Note that cigarettes are such that 37,000,000, 1/6 of the total U.S. population, is killed thereby!-a genuinely significant increase!!). It is essential to understand that what is at issue is an "ultrahazardous activity" as that term is defined in professional material. See an analysis of the concept by the U.S. Supreme Court in the case of Laird v Nelms, 406 US 797; 92 S Ct 1899; 32 L Ed 2d 499 (1972). There, sonic booms and dynamite blasting are discussed in context of "ultrahazardous activity." Each produces a spreading effect. Cigarettes do that via fires and via their toxic chemicals, superheated, moving at high speed. In contrast to sonic booms and dynamite blasting, cigarettes kill 37,000,000 in the U.S. alone, and constitute a "holocaust." This is the most ultrahazardous activity on earth. The point, in law, is that in dealing with "ultrahazardous activity," there is "strict liability" for all consequent damages, even if negligence is not proven. MCL § 750.27, MSA § 28.216, follows the principle that it is unlawful to provide people the means--e.g., a deleterious substance--to injure or kill themselves, even if death is slow, People v Carmichael, 5 Mich 10; 71 Am Dec 769 (1858); People v Stevenson, 416 Mich 383; 331 NW2d 143, 145-146 (1982); and People v Kevorkian, 447 Mich 436, 494-496; 527 NW2d 714, 738-739 (1994). 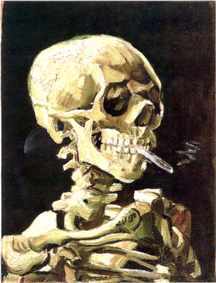 Thus deleterious cigarettes used as intended (to kill) cause a holocaust number of deaths. "In 1604, James I, the King of England, consulted with his court physicians, and issued to his subjects the following proclamation on tobacco: 'A custom loathsome to the eye, hateful to the nose, harmful to the brain, dangerous to the lungs and, in the black, stinking fumes thereof, nearest resembling the horrible Stygian smoke of the hell pit that is bottomless.'" (Page 1). "Half a century after James I issued history's first Surgeon General's report, the French reported that tobacco smoking shortens life and produces, among other things, colic, diarrhea, ulcerations of the lungs, asthma, coughs, pains in the heart, undernourishment and impotence." (P 1). "the 25-year-old who never smoked regularly can expect to live another 48.6 years (8.3 years longer than the 2-pack-a-day smoker) . . . smoking is . . . producing . . . cancer of the larynx, lip, bladder, oral cavity, and esophagus, not to mention stomach ulcers . . . ." (P 3). "pregnant women who smoke run a greater chance of fetal growth retardation, losing their babies through stillbirth or death soon after birth, and of having children who are hyper-kinetic (which is assumed to be the result of brain damage as a result of smoking during pregnancy) . . . . poisonous lead in the fetuses of smoking mothers." (P 4). "Smoking is also suspected of depleting the body of its stores of certain vitamins, especially vitamin C, weakening the body's defenses against some viruses and infections." (P 4). "Carbon monoxide can, among other things, increase the possibility of heart disease and hardening of the arteries (which can decrease the flow of blood to the brain and kill irreplaceable brain cells) by robbing blood vessels of oxygen needed to prevent the build-up of cholesterol." (P 4). "The U.S. Surgeon General's Committee came to several conclusions: that smoking did cause lung cancer, that it was associated with heart disease, that it was the most common cause of chronic bronchitis, and that it substantially increased the risk of premature death. In other words, pretty much the same conclusions reached by the French some 300 years earlier." (P 2). Its conclusion is that: "cigarette smoking still carries its own built-in death penalty." (P 2). In an email message to the website author, Governor John Engler cites bold steps that he has taken to reduce tobacco usage in Michigan, including beginning enforcement of MCL § 750.27, MSA § 28.216, by his 18 March 1992 Executive Order 1992-3 to ban smoking in state buildings, prohibit tobacco sales on state property, and to end production of cigarettes by state prisons. For further reading, see "Products Liability: Cigarettes and Other Tobacco Products," 36 ALR 5th 541-656 (1996) as annually updated (available at law libraries). The 1996 edition replaces the earlier edition, 80 ALR 2d 681 (1961) pursuant to subsequent data. For context, see "Emerging Issues in Toxic Torts," by John J. Delany III. A law review article (summarized by Action on Smoking and Health [ASH], Washington DC) has data on more recent cigarette lawsuits. Citation: Karen E. Meade, "Breaking Through The Tobacco Industry's Smoke Screen: State Lawsuits For Reimbursement of Medical Expenses," 17 Journal of Legal Medicine 113 (1996). And see ASH's list of selected law review articles. The ideal way to protect smokers' rights to a safe product, thus protect nonsmokers as well (via protecting everyone's common law "right to fresh and pure air") is to institutionalize the right. Tennessee, Iowa, and Michigan did this: banned cigarette sales, etc. This is prevention of the harm. When institutionalized prevention of harm fails, then harm actually occurs. Then courts, lawyers, juries get involved. Without institutionalization of the safe product common law right, juries become in essence the the lone tobacco watchdog. According to said Professor Richard Daynard of Boston's Northeastern University Law School: "This is really an extraordinary indictment of what our democracy has come to. The basic institutions of government -- the executive branch and Congress--are supposed to protect us. Unfortunately Congress is owned and operated by the tobacco industry." Daynard, President, Tobacco Control Resource Center, said the burden of controlling the tobacco industry is now left to the smaller courts. "We're left with the safety emergency brakes," said Daynard. "All the emphasis has moved toward the jury system. And damage cases in court are heard after the injury has already occurred." A Pennsylvania anti-smoking group's activist William Godshall says that in Pennsylvania, for example, the fine for selling cigarettes to minors is $25. "I have parking tickets that cost more," Godshall said. "And retail stores have financial incentives to sell cigarettes to 10-year-olds. Most state laws fine the minimum-wage clerks that sold the cigarettes, but the [better solution is to go] after the store owners." "This Congress is not going to do anything that the tobacco industry doesn't want it to do," Godshall said. "You've got three smokers on the Supreme Court--just from the oral arguments back in December, the writing was on the wall." "At this point the jury is the last line of defense for the public health," said Daynard. In March 2000, there was continuing the Engle class-action lawsuit in Miami, Florida, against the five leading cigarette manufacturers. That may deliver a record-breaking damage award amounting to hundreds of billions of dollars, according to the Orlando Sun-Sentinel. Jurors have found the cigarette makers guilty of lying to the public about the inherent risks and addictiveness of smoking. But would a billion-dollar verdict ease the health burden? Not according to Daynard. "In public health, there's an old poem about how a fence at the top of the cliff is much better than an ambulance at the bottom," Daynard said. "This is the ambulance at the bottom." Daynard said that hefty punitive damages could have a positive effect by forcing the tobacco industry to make changes to avoid future similar verdicts. So if prevention is better than treatment, are there any preventive measures left? One of the few restrictions still standing is the Synar amendment enacted by Congress in 1992 as part of the Alcohol, Drug Abuse and Mental Health Administration Reorganization Act. The amendment requires states to sharply reduce cigarette sales to minors or risk losing substance abuse prevention and treatment block grant funding. "It's a pale shadow of what FDA regulations would have done," Daynard said. "It's had some effect but it's a very indirect way of keeping cigarettes from kids." Tobacco is a holocaust, the single most preventable cause of death. Tobacco pushers has for years targeted children before they were able to make decisions about their future. As a result, there are in the U.S. alone, 49 million nicotine addicts. This is the horrifying result in the absence of institutionalized protection of smokers' rights to a safe product. The abolishment of unsafe cigarettes, meaning all of them, would bring to a speedy end, the medical catastrophe the many tobacco effects. This would be an overriding medical advance of a type never seen before, as not even the ending of scourges such as the black plague, scurvy, polio, smallpox, etc., were on the massive scale of the "holocaust" level such as tobacco is. The immediate ending of the tobacco holocaust would be the greatest medical blessing of all time. Warning: Pushers and their accessories are working to undermine and subvert your rights in the jury trial system. See Carl Deal and Joanne Doroshow, "The CALA Files - The Secret Campaign by Big Tobacco and Other Major Industries to Take Away Your Rights" (2000). Kenneth C. H. Willig, "The Bar in the Third Reich," 20 Am J Legal History 1 (1976), excerpted in Law: A Ttreasury of Art and Literature, ed. Sara Robbins (New York: Hugh Lauter Levin Associates, Inc, 1990), pp 222-225. Justice John Paul Stevens, Walters v Natl Assn of Radiation Survivors, 473 US 305, 371 and 371 n 24 (1985) (dissent). Anti-tobacco activist Dr. Judith Mackay is called by tobacco pushers "the most dangerous woman in the world."